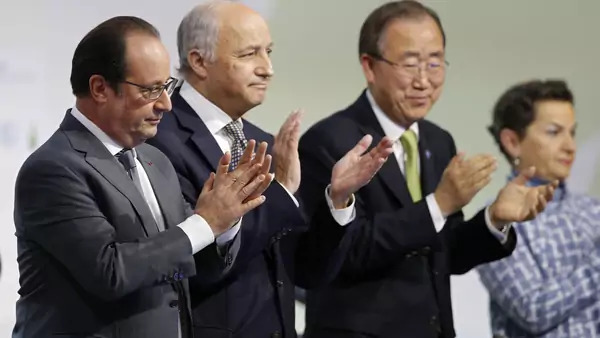 LE BOURGET, FRANCE – The Paris climate summit (also known as COP 21) has adopted a new “Paris Agreement”. The agreement has the potential to mark a laudable and historic shift in how the world negotiates cooperation on climate change. It does not justify the over-the-top claims that some are making – that it spells the end of fossil fuels or assures that temperatures will rise no more than two degrees – but those who negotiated it never believed it could. Nor does it deserve to be pilloried (a rarer but still real reaction) for failing to save the planet – an entirely unreasonable expectation. Instead it begins to set up a framework for transparency and review of countries’ nationally driven emissions-cutting efforts and a process for encouraging stronger efforts over time. In doing so it meets the modest but important goals that were sensibly set for the negotiations. Only time will tell, though, whether the full promise of the Paris Agreement is achieved. The world has come a long way from the vision that animated United Nations (UN) climate negotiations for most of the 1990s and 2000s. That vision centered on a firm division between developed and developing countries. Negotiations focused on dividing up responsibility among developed countries for cutting emissions and assigned them each targets. Those were to be enforced through international law. The Paris Agreement is fundamentally different. All countries, not just developed ones, are supposed to curb emissions. Negotiations did not focus on dividing up that responsibility – instead each country developed its own plans based on its national circumstances. Rather than enforcing these through international law (which has proven to be toothless for climate) the Paris Agreement aims to mobilize political pressure. It does that mainly by mandating a set of transparency measures and a process for regularly and publicly reviewing each country’s progress (though much of the detail on each remains to be developed). It also establishes a process under which each country is supposed to put forward stronger national emissions reduction plans every five years. Nothing in the agreement actually compels countries to do this. But the experience of the past two years suggests that the specter of Paris, where countries were similarly expected to present new emissions cutting plans, spurred meaningful efforts in most major emitters to develop more substantial emissions cutting agendas than they had before. It’s not unreasonable to expect that the twice-a-decade cycle set up under the Paris Agreement could catalyze a similar ratcheting up of ambition on a regular basis. All of this is much more in tune with the underlying political and economic reality of dealing with climate change than most previous international efforts were. The main barriers to strong action are domestic, not international, so letting the process of setting goals play out within each country, rather than around a negotiating table, makes eminent sense. Countries are not yet prepared to pursue tough punishments for counterparts that don’t follow through on their goals. (If they were, then anticipating that, each country would probably ratchet its goal down, itself problematic.) Given that, the best an international agreement can do is boost the political prospects of serious climate efforts in each major country, and strengthen countries’ technical capacity to deliver. The Paris Agreement is a push in that direction. Mandatory transparency and international review, pursued properly, should highlight successes and shortfalls in each country, empowering not only international pressure but, at least as important, domestic political forces that favor stronger and more effective action on climate change too. Yet we have, in important ways, been here before. The Copenhagen Accord, agreed to by every major economy at the 2009 UN climate summit, appeared to dissolve old distinctions between developed and developing countries, requiring everyone to reduce emissions and allowing commitments to policies rather than just to emissions targets; it seemed to include provisions for both transparency and for international review of countries’ efforts; it looked like it had left the Kyoto Protocol in the past. But within days after negotiators departed the Copenhagen summit, itself a procedural mess that ended in spectacular acrimony, prominent parties were disavowing each of these elements. When the next UN summit convened in Cancun a year later, almost every major element of the Copenhagen agreement was relitigated, almost as if the Copenhagen summit had never happened. Indeed many of the core debates at the Paris talks remained the same as those at Copenhagen. But two big positives set Paris apart. There are also some areas where it underwhelms. The first is the agreed process for ratcheting up countries’ emissions-cutting efforts. Every five years, beginning in 2020, each country will be expected to contribute a new national plan for reducing emissions. Ideally this will mean that, rather than dissipating most of their energies fighting over the architecture of a global climate agreement, countries will focus productively on their emissions-cutting initiatives instead. In principle, then, the Paris Agreement could last decades, only with new emissions-cutting efforts every five years. Not since Kyoto has a UN climate agreement been structured this way. There are other novel elements in the Paris agreement that will draw broad attention, most notably an aspirational goal of limiting global temperature increases to 1.5 degrees Celsius (2.4 degrees Fahrenheit) above preindustrial levels, and a promise to grow financial support for poorer countries beyond $100 billion after 2020. These were essential to the diplomatic bargain that sealed the Paris Agreement. But they are so disconnected from the forces that will actually shape policy that they do not rank among the substantively important parts of the deal. There are also elements that the deal would be better off without. One cannot help but be struck by the repeated invocation of “common but differentiated responsibilities” – often used by developing countries to argue that they are subject to weaker obligations than developing countries – in the text. There are, similarly, many places where the demands on developing and developed countries are qualitatively different. Some of these make substantive sense: one shouldn’t expect, for example, India to assist poor countries in transitioning to low-carbon economies in the same way that Europe ought to. But most of these are vestiges of an old way of thinking and are a sign that some fundamental debates aren’t yet resolved. This is particularly worrying in the section on transparency, and may presage intense battles to come. Fortunately, though, sharp differentiation between developing and developed countries is largely absent where it matters most – particularly in most of the basic contours of the process for promoting transparency and scrutinizing countries’ national efforts. The second big distinction from past agreements is the way that the Paris Agreement was concluded. Expectations were kept modest, in line with what might be reasonably expected from an international climate agreement, rather than ratcheted to the stratosphere. The negotiating process was far smoother than the one in Copenhagen, and indeed less contentious than any in recent memory. (That doesn’t mean that there weren’t serious fights – this was, after all, a negotiation.) Negotiators were pleased enough with the process to largely dispense with the usual leaks and often-nasty attacks that typically characterize UN climate summits. The deal concluded also contains many legally binding elements. That may not matter much as a matter of substance (countries violate legally binding international agreements all the time) but it is a stamp of seriousness in many countries that matter. All of this should sum up to make the Paris Agreement appear more legitimate in peoples’ eyes, and thus tougher for countries to backtrack on. Still no one should judge the Paris Agreement too quickly. Its first test will be in the coming days and weeks as leaders and major media around the world talk about the deal. What leaders say will signal how much they see the Paris deal as settled and how they interpret the language that treats developed and developing countries differently. How the media describe the Agreement will shape how the broader public views it, and hence how much of a penalty leaders might face for later backtracking or spinning what the deal says. Its next trial will be at the next UN climate summit in November 2016 in Morocco. Part will be substantive: How will countries flesh out the provisions for transparency, review, and updating of national efforts that are outlined in the Paris Agreement? Part will be more fundamental: How many of the fights that the Paris Agreement appears to resolve will be refought? The biggest test will come in 2020 when countries are supposed to contribute new emissions-cutting plans. Will they actually do that? The Kyoto Protocol was supposed to be a lasting structure for climate cooperation. Countries initially made commitments for the 2008-2012 period and were supposed to extend those to a second “commitment period” around 2009, allowing the Protocol to evolve. When most decided not to do that, Kyoto was effectively dead, and negotiations proceeded to focus on rewriting the entire climate regime. Paris is the result of that process. Like the Kyoto Protocol, the Paris Agreement aspires to be an enduring framework for international climate cooperation. If countries follow the Agreement and come to the table in 2020 with serious new climate efforts, Paris will have succeeded where Kyoto failed, and will establish itself as a more enduring international framework. The ultimate test of any climate change effort, of course, is whether it substantially reduces the risks of dangerous climate change. We will not know whether Paris meets this test for a long time. The Paris Agreement could survive as an international framework even as national actions on climate change turn out to be woefully inadequate to dealing with climate change. This could be the case even if the Paris Agreement were perfect (which it is not) since it is national politics and policies, not international agreements, that are the prime drivers of emissions-reducing actions. Paris looks like a success in part because, understanding that national politics and policies are paramount, its organizers wisely downplayed expectations for any deal. No one should forget that it is these modest expectations that Paris has largely met. For the time being, though, the Paris Agreement deserves applause. It is a far sounder substantive foundation for international climate cooperation than the Kyoto Protocol ever was, and appears likely to enjoy much more legitimacy and thus staying power than the Copenhagen Accord ever managed. Foreign policy should be judged against the realistically available alternatives – and Paris, whatever one might reasonably say about what it doesn’t do, looks like a success against that measure. Now the hard work of building on it, within each country and internationally, begins.